Spellbreaker has made multiple appearances throughout the series; for more information, see the lore article. 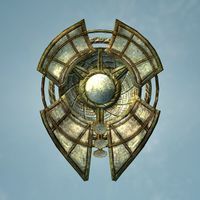 When walking around with this shield equipped, some NPCs will comment on it. Guards will normally say "Your shield... Dwarf-make, is it not? But yet it seems so much... more". When attempting to block spells that are more powerful than the shield's Ward can withstand, the Ward will break, and the player will stagger. As such, use with caution against very high-level mages. The Shield will level Blocking normally, but has no effect on leveling Restoration. This shield can be very helpful to mages, as shields do not negate the Alteration perk Mage Armor. During the First Lessons at the College of Winterhold, Tolfdir will accept a block using the Spellbreaker as though you are using a ward. Spellbreaker's ward benefits from both the Ward Absorb perk and Ahzidal's Gauntlets, both of which allow your wards to absorb a portion of the magicka cost of the spell that hits the ward. The Elemental Protection perk does not affect the strength of Spellbreaker's ward. This issue has been addressed by version 1.27 of the Unofficial Skyrim Patch; which allows the Dwarven Smithing perk to affect its tempering.